November 4, 2010 – The United Nations General Assembly today convened to adopt its annual resolution on the â€œSituation in Afghanistan.â€ The adoption of the resolution signifies the GAâ€™s continued support and commitment for lasting peace, security and stability in Afghanistan. During his statement, Ambassador Tanin outlined the many important developments which took place over the course of the year. Among them include President Karzai national agenda, announced in November of last year, which prioritized reintegration and reconciliation, security, governance, development and regional cooperation for the coming years. He also highlighted Afghanistanâ€™s national consultative peace-jirga; the outcome of the London and Kabul Conferences, and the holding of recent Afghan parliamentary elections. In the area of socio-economic development, he said that â€œthe average income had nearly quadrupled since 2001â€, while â€œgovernment revenue surpassed one billion dollars for the time,â€ in Afghanistanâ€™s history. In the areas of education and health, he referred to the â€œ71% student enrollment rate, construction of 4,000 schools over the past nine years, and increased accessibility to health-care, including immunization for children, which has led to a decrease in the under-five and infant mortality rates. With regard to empowerment of women, he said Afghan women would make up more than quarter of the Afghan national assembly. Further, he stated that the percentage of female government employees had increased to 18 percent and number of females serving in Afghanistanâ€™s national security forces (ANSF) exceeded 1,000. Turning to the recent parliamentary elections, he noted that the recent polls were the first which were led by Afghans, and highlighted the broad participation of all segments of society in the elections. 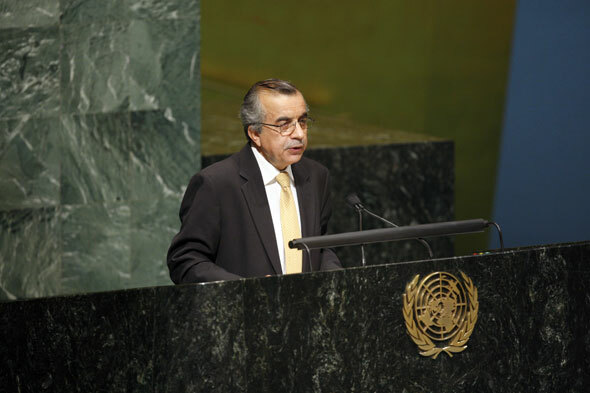 â€œThis recent election included 2,556 candidates, 406 of whom were women.Â Millions of Afghans cast their ballot to choose 249 members of parliament, shaping our nationâ€™s future by strengthening Afghan institutions and building momentum for stabilization,â€ said Ambassador Tanin. Ambassador Tanin alluded to continued efforts of the Afghan government to strengthen bilateral cooperation and collaboration with neighboring and regional partners. In that regard, he referred to President Karzaiâ€™s visits to China in March, India in April, Japan in June and Pakistan in September. He also underscored President Karzaiâ€™s participation in various regional forums, including the South-Asian Association for Regional Cooperation (SAARC) Summit in Bhutan in April, as well as the Afghanistan-Pakistan-Turkey Trilateral in January; Afghanistan-Iran and Tajikistan Trilateral in Tehran; Afghanistan-Iran-Tajikistan Trilateral in Tehran, and the Afghanistan-Pakistan-Tajikistan-Russian Federation Trilateral in SOCHI. On security, Ambassador Tanin noted that terrorists and extremists continued their efforts to expand the scope of their attacks. â€œThe Taliban and its allies continue their attempts to increase insecurity and spread violence to new parts of the country.Â The violent campaigns of the Taliban and Al-Qaeda have killed thousands of innocent men, women and children,â€ he said. He however affirmed that Afghanistan and its international partners continued progress in the fight against terrorism by disrupting and defeating the activities of extremist groups. He also stated that Afghanistanâ€™s transition strategy would be among the important issues to be discussed at the NATO Summit. Ambassador Tanin reiterated Afghanistanâ€™s commitment in building the size and strength of its national army and police so as to â€œtake the lead in combat operation in volatile provinces by 2011 and assume full security responsibility by 2014.Â He noted that the transition process would be a â€œgradual and conditions-based process,â€ which required the sustained support of the international community for increased Afghan security force capability. He also said that achieving peace and security would not be possible by military means alone.Â He noted that â€œreconciliation and reintegration of former combatants is critical for establishing peace and security in our country.â€ He referred to Afghanistanâ€™s peace and reconciliation initiative, aimed at â€œreconciling those who would like to join the peace process.â€Â In that regard he emphasized that â€œhuman rights, including the rights of women would remain a priority,â€ throughout the reconciliation process. Ambassador Tanin reiterated the sincere thanks and appreciation of the Afghan people and government for the continued support and commitment of the United Nations, and the international community for lasting peace, security and stability in Afghanistan.